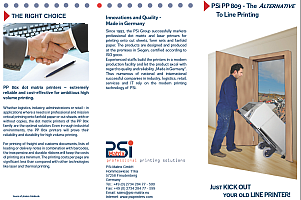 Whether logistics, industry, administrations or retail – in applications where a need is in professional and mission critical printing onto fanfold paper or cut sheets, with or without copies, the dot matrix printers of the PP 80x family are the optimal solution. Even in rough industrial environments, the PP 80x printers will prove. Just KICK OUT your old LINE PRINTER!